Published in: Kjellman, F.R. (1889). Om Beringhafvets algflora [About the Bering Sea algae]. Kongl. Svenska Vetenskaps-Akademiens Handlingar 23(8): 1-58, pls I-VII. Type locality: "Beringön, temligen ymnig; sällskaplig inom öfre delen af sublitoralregionen, fäst på sten; temligen rikligt sporocarpiebärande [pretty abundant, gregarious in the upper part of the sublitoral zone, attached on stone; tolerably abundant cystocarps; Bering Island, Commander Islands, Russia]" (Lindstrom et al. 2011: 670). Lectotype: F.R. Kjellman (Vega Expedition); 14-19 August 1879; S upper left specimen (Lindstrom et al. 2011: 670). Notes: Lectotype designated by Lindstrom et al. (2011: 670). Additional type material housed in UPS. North America: Alaska (AK) (Saunders 1901, Lindstrom 1977). Asia: Japan (Mikami 1965, Segawa 1981), Russia (Lindstrom et al. 2011). Mikami, H. (1965). A systematic study of the Phyllophoraceae and Gigartinaceae from Japan and its vicinity. Memoirs of the Faculty of Fisheries Hokkaido University 5(2): 181-285. Okamura, K. (1908). Icones of Japanese algae. Vol. I pp. 147-177, pls XXXI-XXXV. Tokyo: The Author. Ohno, Y., Masuda, M. & Kurogi, M. (1982). 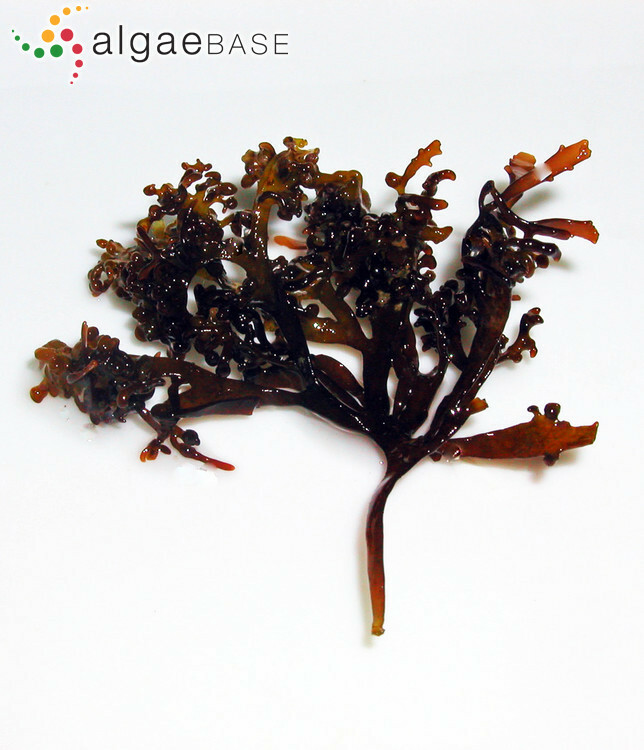 Reproductive phenology of Gigartina pacifica-ochotensis and Petrocelis (Rhodophyta) in Oshoro Bay, Hokkaido. Japanese Journal of Phycology 30: 125-133. Michael Guiry in Guiry, M.D. & Guiry, G.M. 2019. AlgaeBase. World-wide electronic publication, National University of Ireland, Galway. http://www.algaebase.org; searched on 26 April 2019.